Boy, finally making some progress on the quilts I'll be sending home before my trip back home in September! But the biggest progress has been on my design wall. Since I don't have a designated wall space for a design wall, I decided to build one in three sections. Finished the second section last night & I don't know how I "lived" before having a design wall! Pictures show my crazy brain storm for my design wall. Not the most professional one, but it works! 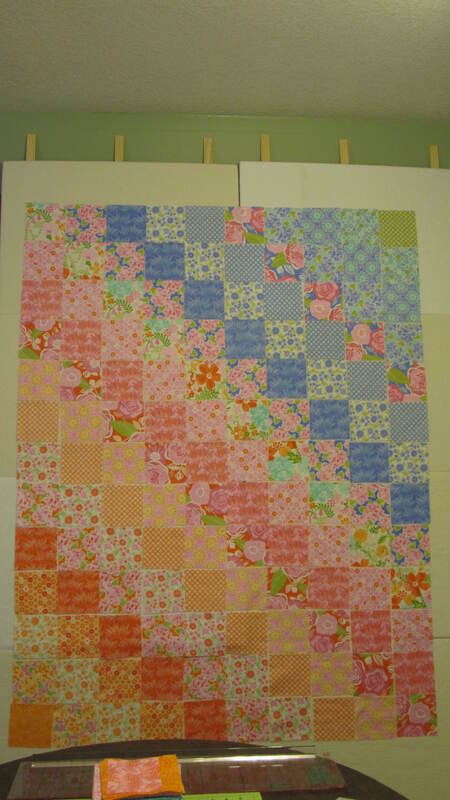 I was able to finished part of one quilt top and then lay out the blocks for the second quilt top. 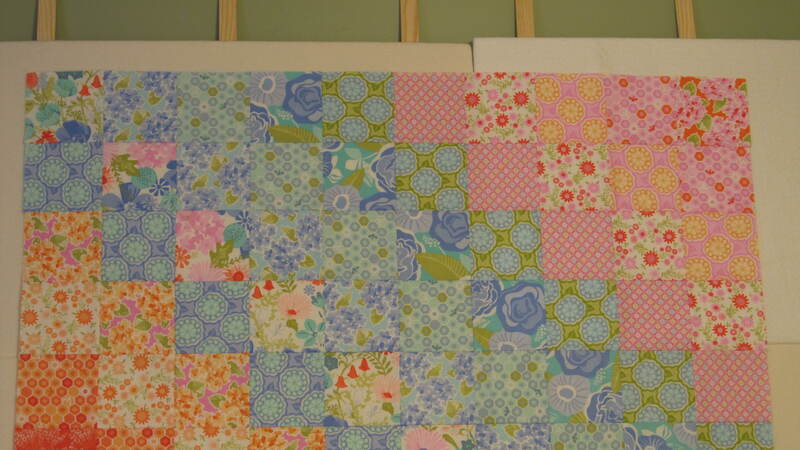 And then I can continue on the third quilt top. My daughter said to me today, "Mom, which project is what? You have so many!" I just chuckled! 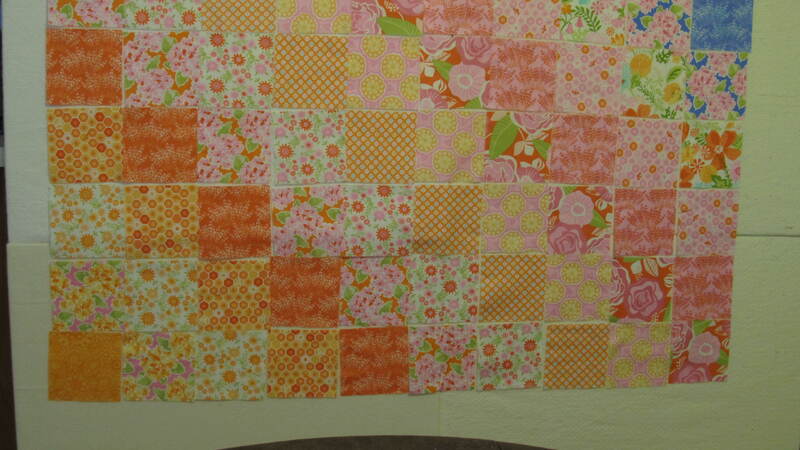 But then she asked if I was going to make her a quilt for her bed when she moves into her studio apartment? Guess that's another project! 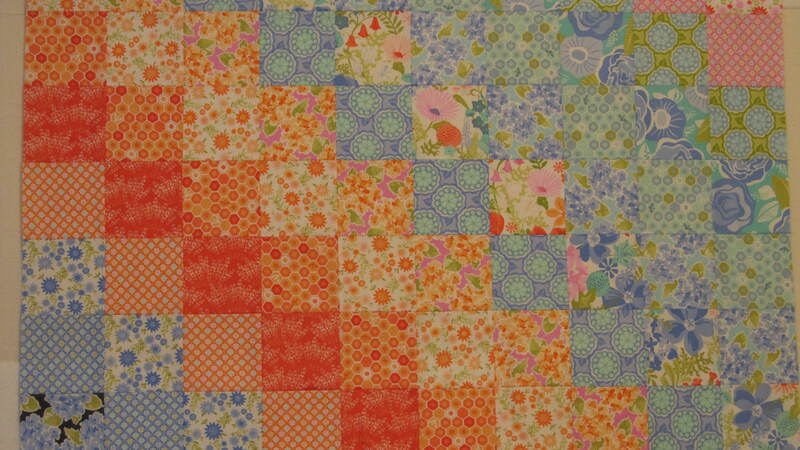 Here are the pictures of the two girls quilts I'm working on. 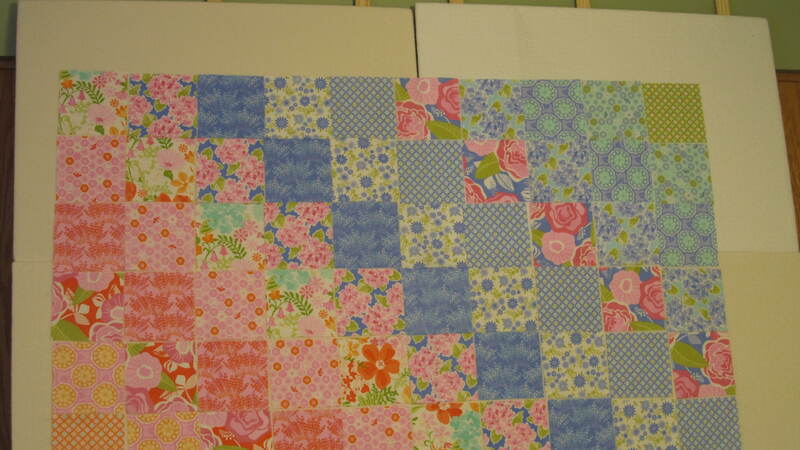 The blocks of one are all sewn together and the other needs to be sewn. They both get big white daisies on top of the blocks. Also will add borders. They are made out of Moda's Honey Honey. I LOVE THAT FABRIC! Happy 4th. of July to everyone!! Live, Laugh, Love & Quilt! MacGyver couldn't have done better. 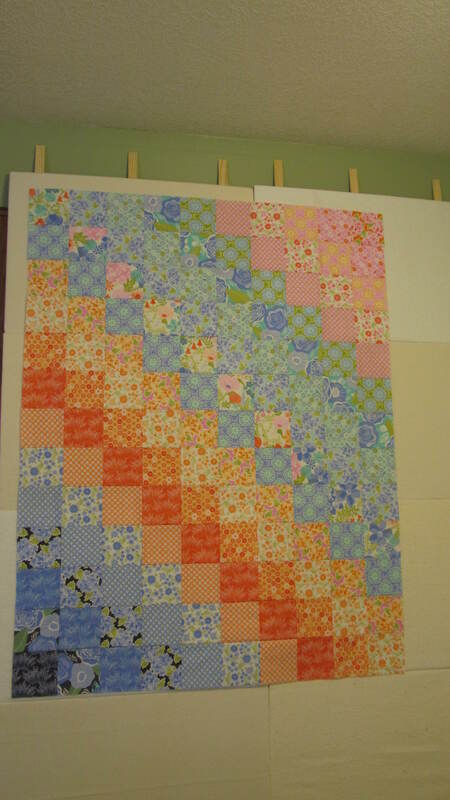 Very pretty quilts, great ingenuity on your design wall! Very good idea for a design wall. Beautiful quilts! I love this line of fabric also. Thanks for the inspiration. Love your design wall inspiration and the fabrics are indeed lovely - thanks for letting us know the source. 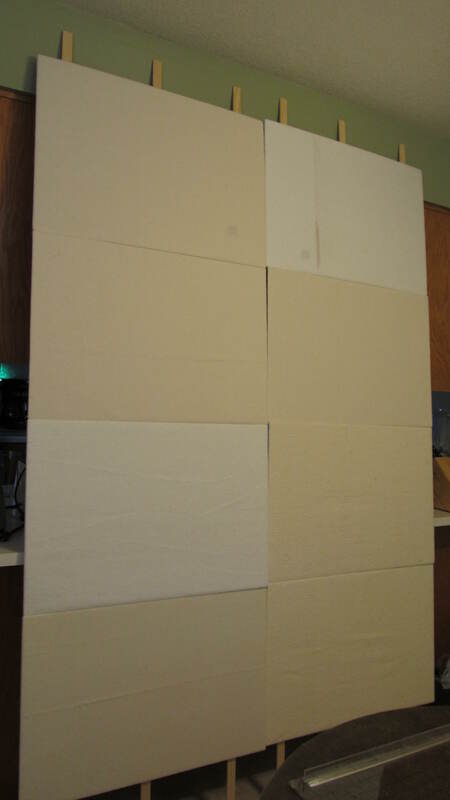 Did you use the foam core poster board and cover each one with batting? It's a great idea. Yes ... I bought the foam poster board at the dollar store ... bought 12 of them. 4 for each section. The wood is solid pine lattice from Meeks at 69 cents a linear foot. I ended up using 15 - 8ft lengths. The batting was from scrap!! 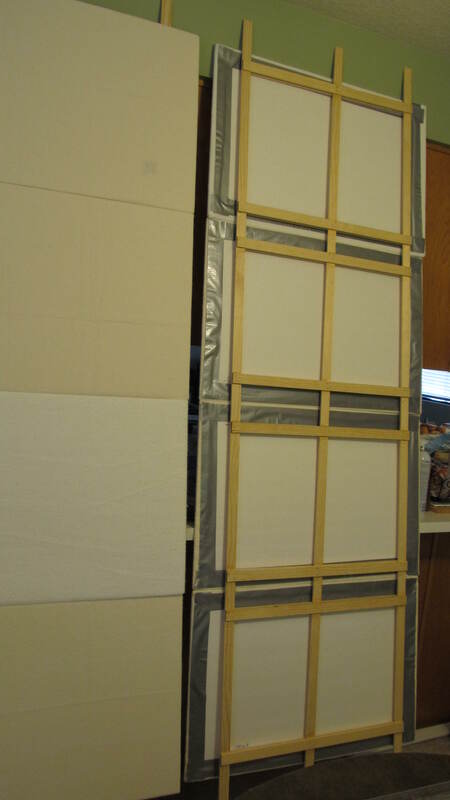 Bought two 20 ft. rolls of sticky back velcro to attach the boards to the wood cross bars. I kept saying to myself, "Thank you, Dad, for letting us watch you work in your wood shop when we were kids." What I like about having the wall in 3 sections is that if I am working on a small project, I just need to use one section. So if there's anyone out there who has limited space, a design wall is possible! Sweet quilts. Nice design wall. You did a fantastic job!! Way to go! Nice quilts! Thanks for the details on the design wall. I will have to try that. Love your design wall. Since my sewing room became much smaller in our new home, I need to think about doing something similar. I hadn't even thought about your way, so thanks for the brilliant idea! The quilts are gorgeous, simply awesome. Love that color combination. I guess I have some fabric to find! 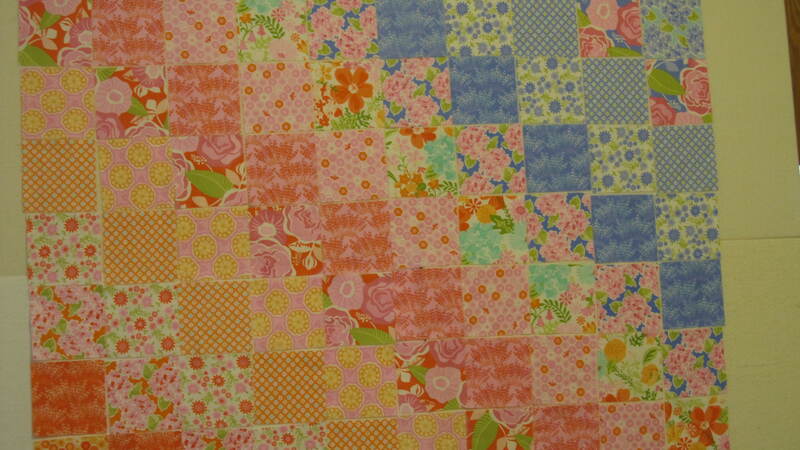 I used charm packs for both quilts. Had to buy 13 packs to get enough squares of the same color/design since the rows were laid out on the diagonal. Needless to say, I have a lot of left over squares. But I'm sure I will be able to use them in other projects. 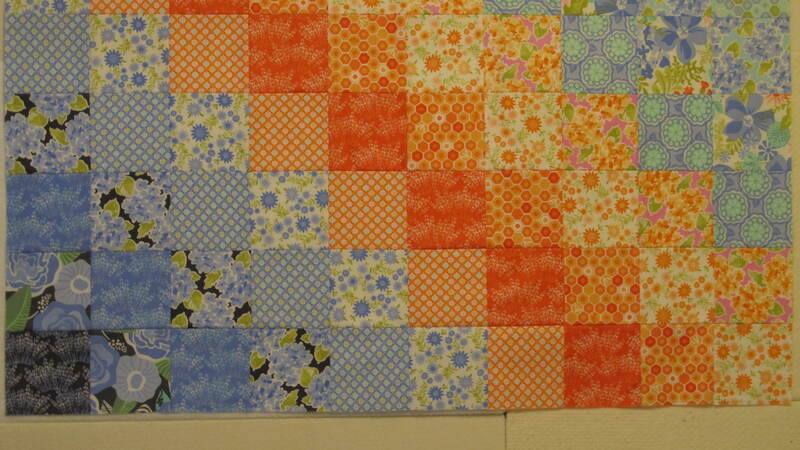 I still have to sew the squares together on the second quilt. Then it's adding borders and huge white daisies to the top! The pattern is called Daisy Doodle. When I have both of them finished, I'll post the pictures. I'm really enjoying the design wall.